It’s September and as usual the end of summer also means a new version of iOS. First announced at Apple’s annual Worldwide Developer’s Conference (WWDC) in June, iOS 11 is perhaps not as radical a change as previous Apple updates. However, there are lots of really nice updates, especially if you use an iPad. We have been testing iOS 11 all summer and some of the user interface updates such as the redesigned control center and the updated App Store are very welcome. From our point of view, updates that are likely to effect Pulsate are always our focus. Thankfully, there are no new features that directly impact how Pulsate operates. There is, however, an update to how your app asks for permission to access user location so I wanted to outline the changes here and how they will effect apps that use Pulsate. The Location permission is one of the core permissions that Pulsate requires to enable us to provide location based alerts and track user interactions with geofences and beacons. 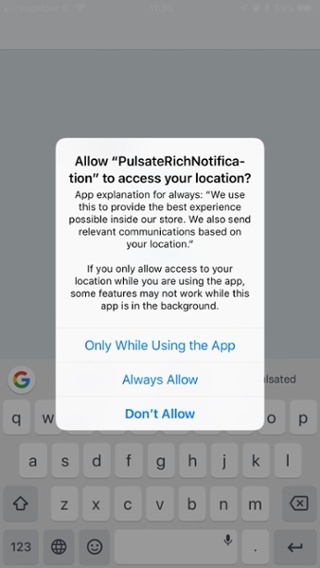 Before iOS 11, there were two separate methods for asking users to give your app (and therefore Pulsate) access to their location, Always Allow and When the App is in Use. You could choose whether to ask the user for either the Always On permission or for permission to get their current location only when they were using your app. 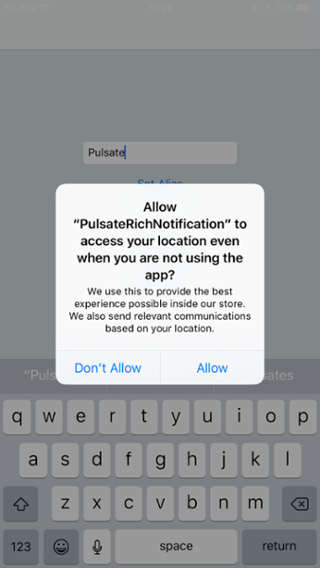 Of course, most users are not using your app when they walk into a geofence or beacon region so Pulsate requires the Always On permission. It is possible that users will not understand why they should give your app Always On permission so it is really important that you make a strong case that clearly explains the benefits of the user choosing the Always Allow option. As you can see on the iOS 11 image above, Apple give you some space on the location permission modal to make your case to the user why they should give your app permission to access their location. Now is a good time to review the message that you are giving users in this modal to make sure that it clearly communicates the reasons why users should give the app the Always Allow permission. All new users who download your app for the first time will see this new permission modal. Current users will also be periodically asked by iOS if they wish to continue giving your app the Always On permission to access their location or if they wish to change the permission to Only While Using the App or stop giving the app permission to access their location. It is really important to get your message across as clearly and concisely as possible to ensure users understand why they should continue to give your App the Always Allow permission. Having said that, no matter how clearly you communicate the benefits for users if they give the Always Allow permission, it may be difficult to get the full range of benefits across to users in the limited space available on the location permission modal. That is why we have always advocated that apps should bring new users through an on boarding process that explains the benefits of allowing the app to access their location. More information on building an on boarding process to maximize location permission acceptance can be found in our Academy here. Many of our clients have also found great success using Permission Priming to encourage users to accept location permissions. We have found over the years that apps that clearly outline the benefits of why a user should give that app the Always Allow location permission through an onboarding or permission priming process get much higher location permission approval rates than apps that do not clearly outline the benefits for the user. On a related note, it was reported earlier in the summer that Apple were adding a blue bar (immediately nicknamed the Blue Bar or Shame) that would be displayed at the top of the user’s screen every time they an app used Background Location. Our core geofencing offering of radial fences with a minimum radius of 100m doesn’t use Background Location so this update does not affect anyone using standard Pulsate geofencing. Some of our clients use our microfencing high accuracy geofencing mode and that mode does use Background Location. However, we are happy to say that Apple have decided against implementing the blue bar (of shame!) unless your app specifically opts into it. The public release date of iOS 11 is likely to be announced at an Apple event on September 11th and, based on previous years, it is likely that iOS 11 will be released to everyone about a week after that event. So now is definitely a good time to start thinking about any changes that you wish to make related to how you ask users to give you the location permission to ensure the best possible results.